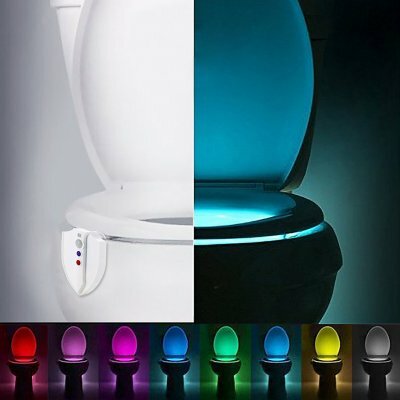 Successfully Added Motion Activated UV Sterilization Toilet Light to your Shopping Cart. Press the UV sterilization button,UV germicidal lamp will automatically work, and shut off 2 minutes later. Almost similar products on the market dont have this function. The toilet night light is motion activated, light-sensitive and solves all your night time bathroom problems. With the touch of a button, you get your choice of 8 different colors. The light stays on long enough to accomplish your task and still have light. It keeps 2 minutes lasting time. The toilet light is adjustable, so you can adjust it to suitable degree. Do not look directly into the UV lamp to prevent damage to the eyes.